Don's Barber Shop, Mt Zion, United States - Barber Shop in Mt Zion, IL. Don's Barber Shop - Barber Shop in Mt Zion, IL. 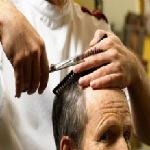 At Don's Barber Shop in Mt Zion, Illinois, we offer many kinds of boys and men's haircuts and hairstyling services. We also do hot lather shave, giving you a smooth and spotless face.